2 Following the publication of the Open Public Services White Paper in July 2011, the Government, with other interested parties, conducted a listening exercise to understand better the potential impact of its commitments including considerations for effective implementation of policies. Over 750 responses were received over the period of the exercise (July – September 2011). Responses came from a range of organisations and individuals including from the voluntary sector, private sector, local government and members of the public. Nearly 40 events were held across to hear directly from respondents. The next few slides summarise the responses received during the exercise from a range of stakeholders and do not represent one particular organisation or individual. The responses are set out against the corresponding chapter in the White Paper. 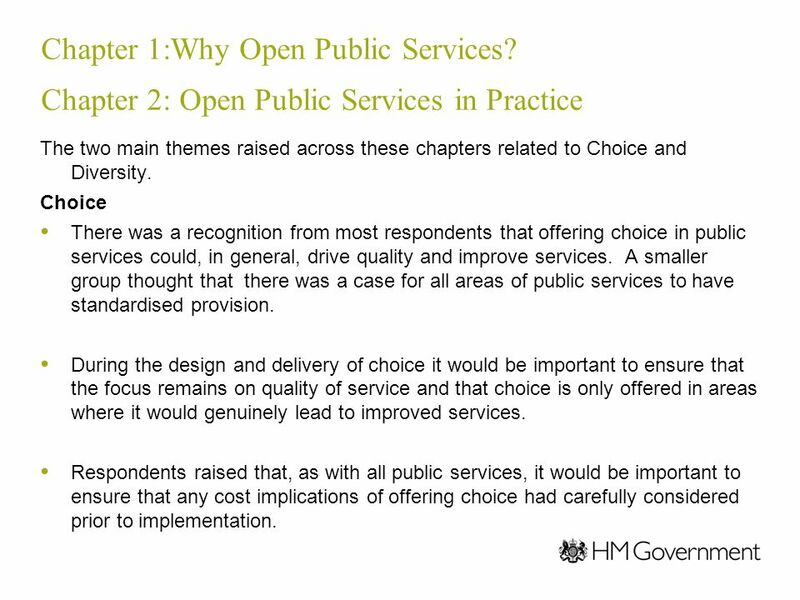 3 Chapter 1:Why Open Public Services? Chapter 2: Open Public Services in Practice The two main themes raised across these chapters related to Choice and Diversity. Choice There was a recognition from most respondents that offering choice in public services could, in general, drive quality and improve services. A smaller group thought that there was a case for all areas of public services to have standardised provision. During the design and delivery of choice it would be important to ensure that the focus remains on quality of service and that choice is only offered in areas where it would genuinely lead to improved services. Respondents raised that, as with all public services, it would be important to ensure that any cost implications of offering choice had carefully considered prior to implementation. 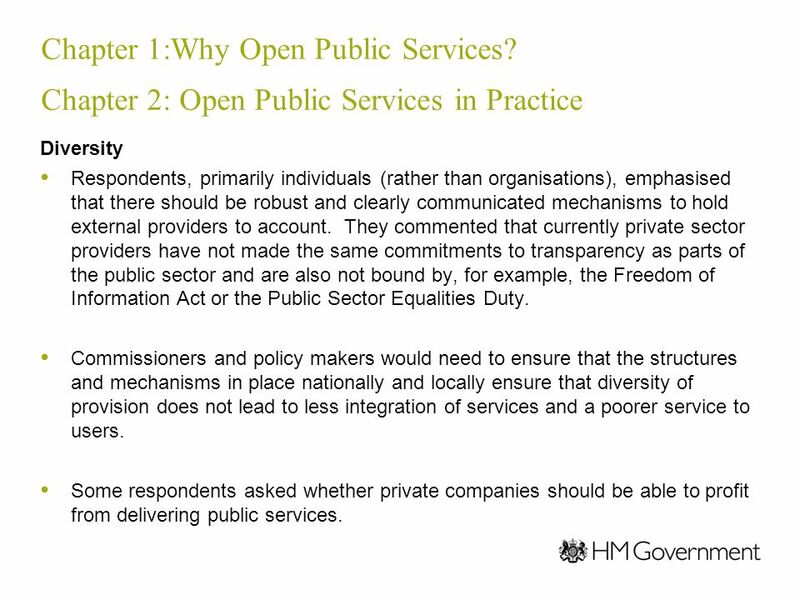 4 Chapter 1:Why Open Public Services? Chapter 2: Open Public Services in Practice Diversity Respondents, primarily individuals (rather than organisations), emphasised that there should be robust and clearly communicated mechanisms to hold external providers to account. They commented that currently private sector providers have not made the same commitments to transparency as parts of the public sector and are also not bound by, for example, the Freedom of Information Act or the Public Sector Equalities Duty. Commissioners and policy makers would need to ensure that the structures and mechanisms in place nationally and locally ensure that diversity of provision does not lead to less integration of services and a poorer service to users. Some respondents asked whether private companies should be able to profit from delivering public services. 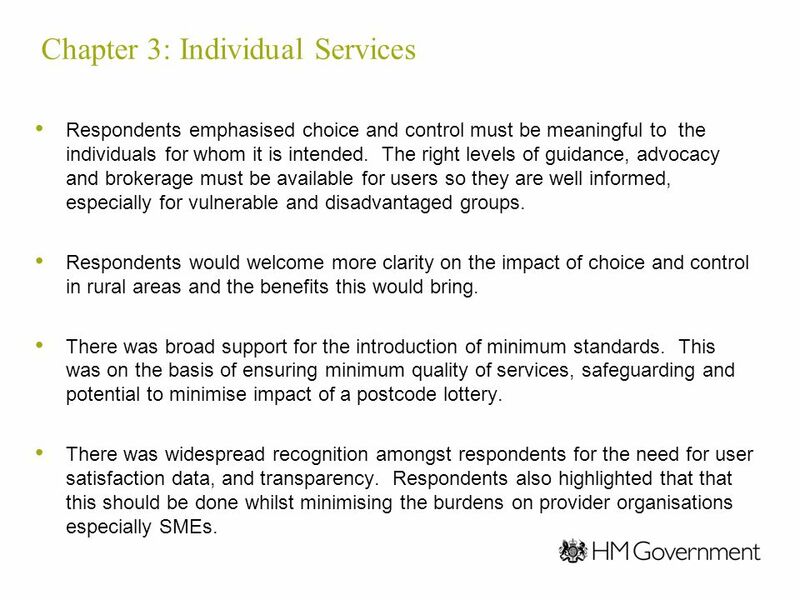 5 Chapter 3: Individual Services Respondents emphasised choice and control must be meaningful to the individuals for whom it is intended. The right levels of guidance, advocacy and brokerage must be available for users so they are well informed, especially for vulnerable and disadvantaged groups. Respondents would welcome more clarity on the impact of choice and control in rural areas and the benefits this would bring. There was broad support for the introduction of minimum standards. This was on the basis of ensuring minimum quality of services, safeguarding and potential to minimise impact of a postcode lottery. There was widespread recognition amongst respondents for the need for user satisfaction data, and transparency. Respondents also highlighted that that this should be done whilst minimising the burdens on provider organisations especially SMEs. 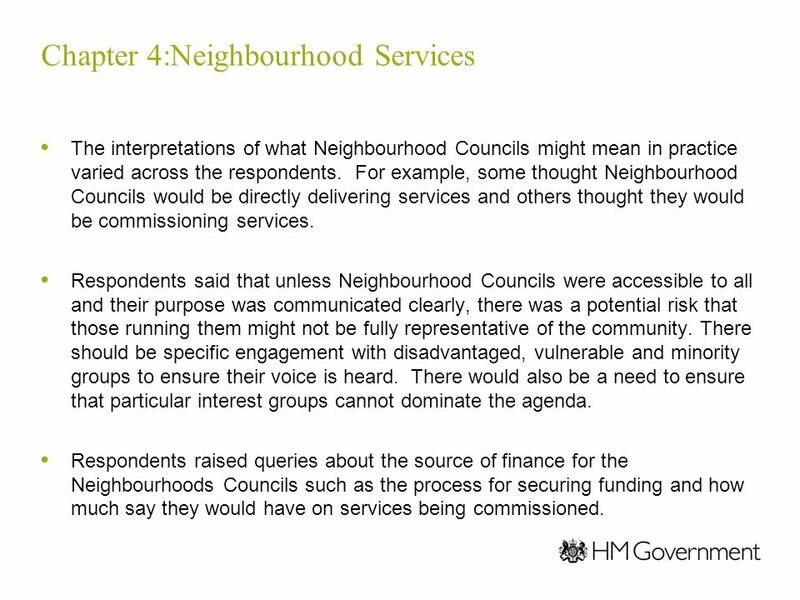 6 Chapter 4:Neighbourhood Services The interpretations of what Neighbourhood Councils might mean in practice varied across the respondents. For example, some thought Neighbourhood Councils would be directly delivering services and others thought they would be commissioning services. Respondents said that unless Neighbourhood Councils were accessible to all and their purpose was communicated clearly, there was a potential risk that those running them might not be fully representative of the community. There should be specific engagement with disadvantaged, vulnerable and minority groups to ensure their voice is heard. There would also be a need to ensure that particular interest groups cannot dominate the agenda. Respondents raised queries about the source of finance for the Neighbourhoods Councils such as the process for securing funding and how much say they would have on services being commissioned. 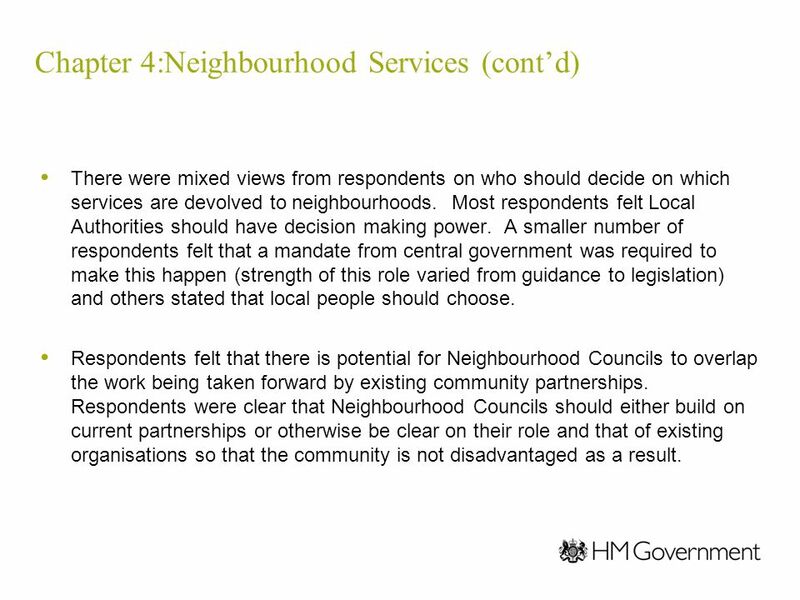 7 Chapter 4:Neighbourhood Services (cont’d) There were mixed views from respondents on who should decide on which services are devolved to neighbourhoods. Most respondents felt Local Authorities should have decision making power. A smaller number of respondents felt that a mandate from central government was required to make this happen (strength of this role varied from guidance to legislation) and others stated that local people should choose. Respondents felt that there is potential for Neighbourhood Councils to overlap the work being taken forward by existing community partnerships. Respondents were clear that Neighbourhood Councils should either build on current partnerships or otherwise be clear on their role and that of existing organisations so that the community is not disadvantaged as a result. 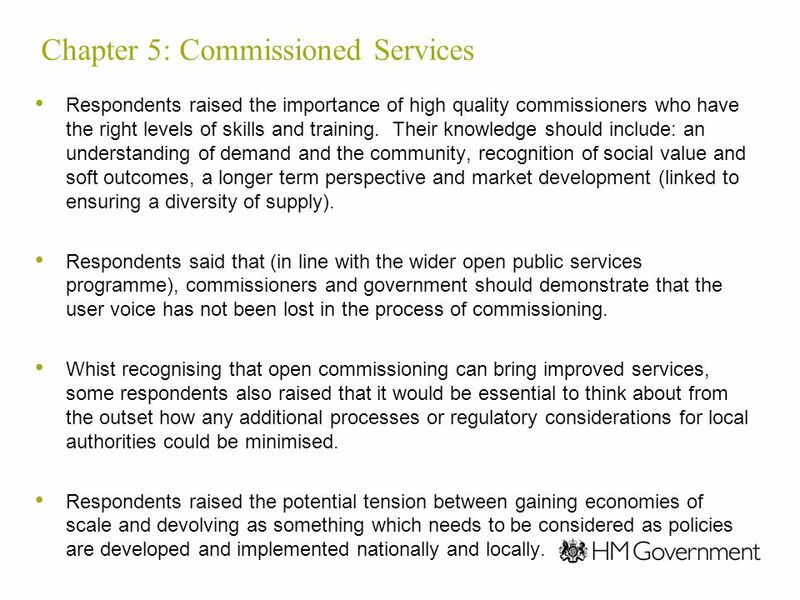 8 Chapter 5: Commissioned Services Respondents raised the importance of high quality commissioners who have the right levels of skills and training. Their knowledge should include: an understanding of demand and the community, recognition of social value and soft outcomes, a longer term perspective and market development (linked to ensuring a diversity of supply). Respondents said that (in line with the wider open public services programme), commissioners and government should demonstrate that the user voice has not been lost in the process of commissioning. Whist recognising that open commissioning can bring improved services, some respondents also raised that it would be essential to think about from the outset how any additional processes or regulatory considerations for local authorities could be minimised. Respondents raised the potential tension between gaining economies of scale and devolving as something which needs to be considered as policies are developed and implemented nationally and locally. 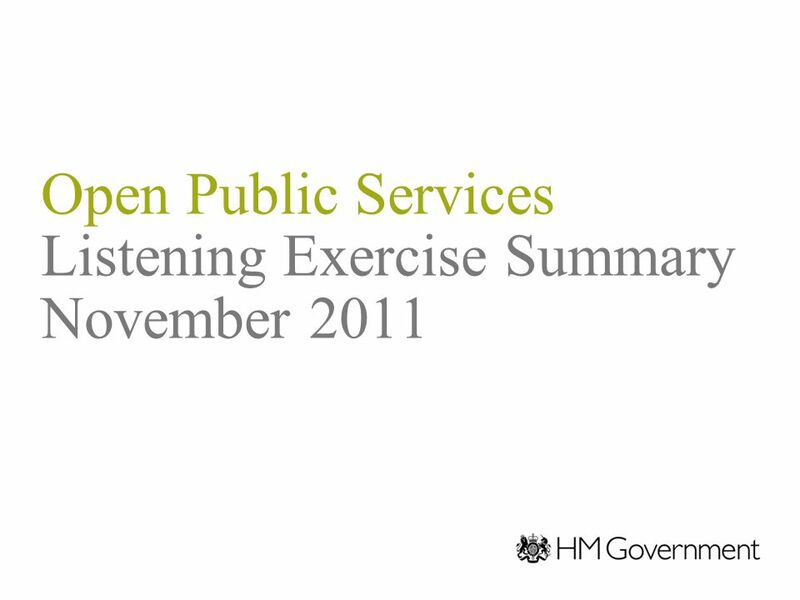 Download ppt "Open Public Services Listening Exercise Summary November 2011." Critical Success Factors for Community and Social Enterprise in Deprived Communities. Shaping the Market Provider Engagement Events June and July 2009 Summary. Personalisation in Leicestershire. Why do we need to change? The present system – Based on matching a limited range of services to people’s assessed needs. Connecting government services to improve community outcomes Establishing Victorian state-wide area based governance architecture Presentation to the VCOSS. Enhancing Access To, and use and Quality of, Information and Communication Technologies. Sustainable Community Strategy – Cohesive and Strong Communities Cohesive and Strong Communities Theme Debate Introduced by: Diane Rutter – Community Impact. PUTTING PEOPLE FIRST WORKSHOP FRIDAY 7 MARCH 08. Key documents Vision, specific expectations, proposed support mechanisms and resources set out in two. Bath and North East Somerset – The place to live, work and visit “Think Local” The Council’s New Procurement Strategy Cllr David Bellotti Cabinet Member. Jane Jobarteh Midlands and East May 2013 The Future of Social Care Patients First and Foremost. Caring for our future Caring for our future: shared ambitions for care and support Emerging thinking: Markets November 2011. Big Sell 3 rd October 2012 CONSORTIA AND COLLABORATION Maggie Jones Children England. The Care Act: Reforming Care & Support Staff Conference 10 November 2014 Cathy Kerr, Director, Adult and Community Services. Australia’s Experience in Utilising Performance Information in Budget and Management Processes Mathew Fox Assistant Secretary, Budget Coordination Branch. Supporting and investing in Camden’s voluntary and community sector (VCS) Proposed investment and support programme. Version 1 | Internal Use Only© Ipsos MORI 1 Version 1| Internal Use Only Sheffield CCG CCG 360 o stakeholder survey 2014 Summary report. Liberating the NHS: Developing the healthcare workforce Workforce planning, education and training Consultation Engagement.